I know I haven't written here in a while. I could say I've been busy, but I haven't been any more busy than usual, really. The actual truth is - I wasn't motivated enough to post about anything. I even went on a brief vacation to Myrtle Beach. When I go through the pictures from that lovely interlude, I'll post about that. Today, hubby took me on the Miami River Historic Cruise - an early Christmas treat. I love history and although there is very little left of old Miami along the river, I like to imagine what it used to be like. 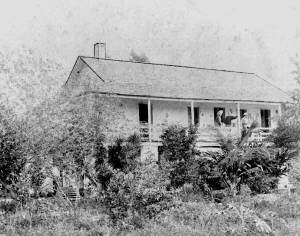 Those are my favorite stories - about the early Miamians who had a jungle around their house and panthers in the back yard. It must have been beautiful, but buggy, at least in the summer. Without further ado, here are today's pictures from the cruise up and back down the Miami River. The picture at top is all that is left of some Indian Chieftain's palace or worship center from 2000 years ago. 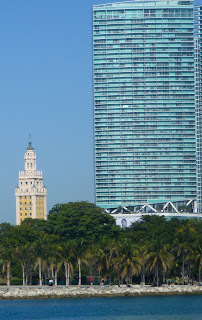 It is the Miami Circle, right at the meeting of the Miami River and Biscayne Bay. This must have been the only cleared area for miles and all around it must have been jungle. Below is what is at the mouth of the Miami River and Biscayne bay today. I guess it's beautiful in it's own way, but I always prefer nature and the original way things were. 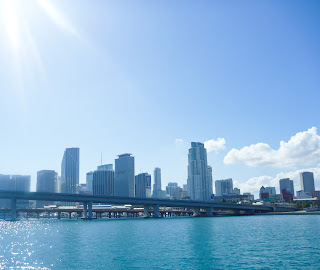 Below - the Miami Skyline - pretty impressive if you like city skylines. Above - what is left of a wall created for a big Bicentennial plan that fell short. 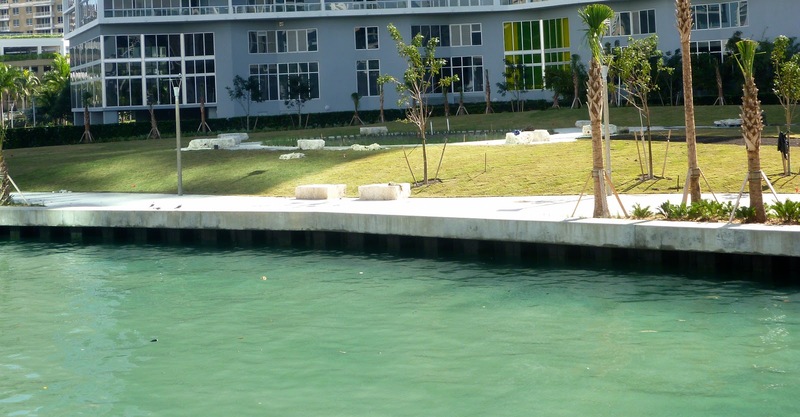 This wall is just at the north entrance of the Miami River and Biscayne Bay. 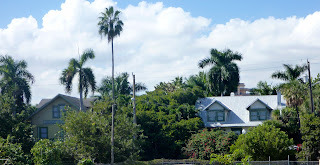 Above - Julia Tuttle's house. 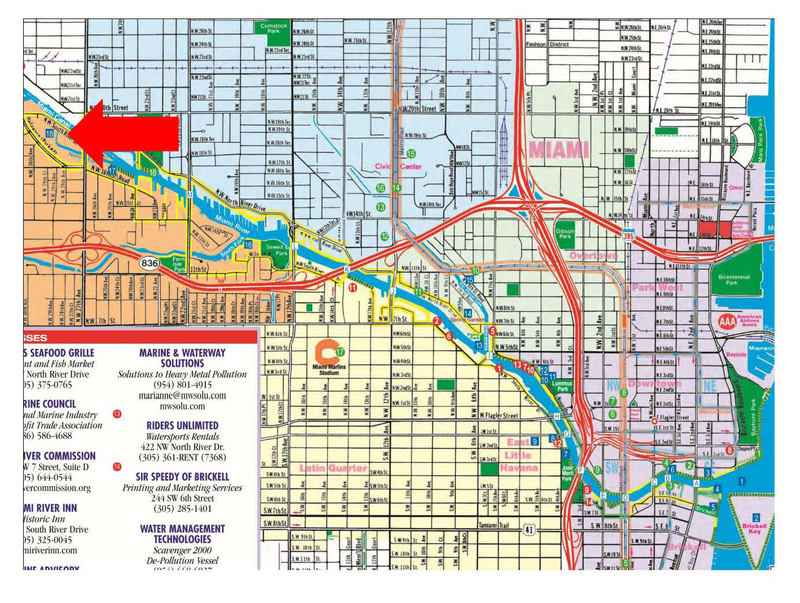 This is what was originally on the North side of the Miami River and Biscayne Bay. It was part of Fort Dallas. 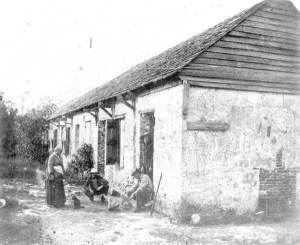 The building above was slave quarters in the same area on the north side of the Miami River mouth. 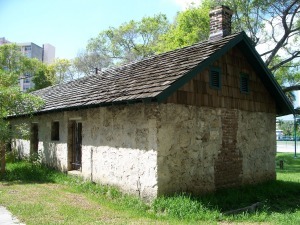 In the 1830's William English built a plantation here and these were the slave quarters. 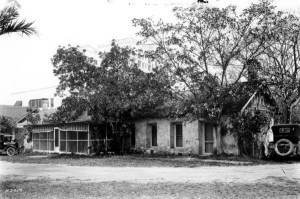 Later, during the Seminole Wars it became part of Fort Dallas. 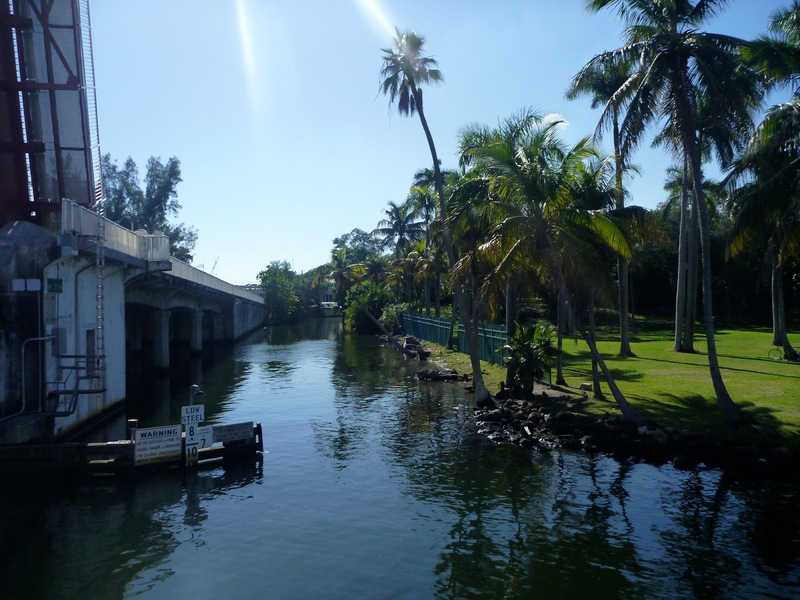 Today this building resides in Lummus Park along the Miami River. You can see the picture below on Flickr. It is not my picture. 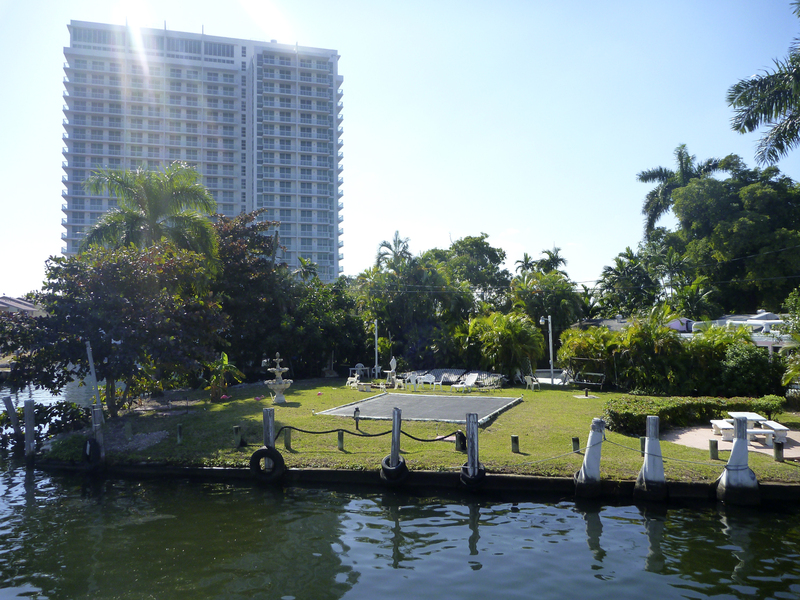 Above is Sewell Park - a little piece of land on the Miami River that looks like it should. The land back of the river slopes up on a limestone shelf - interesting in an area that is characteristically flat. 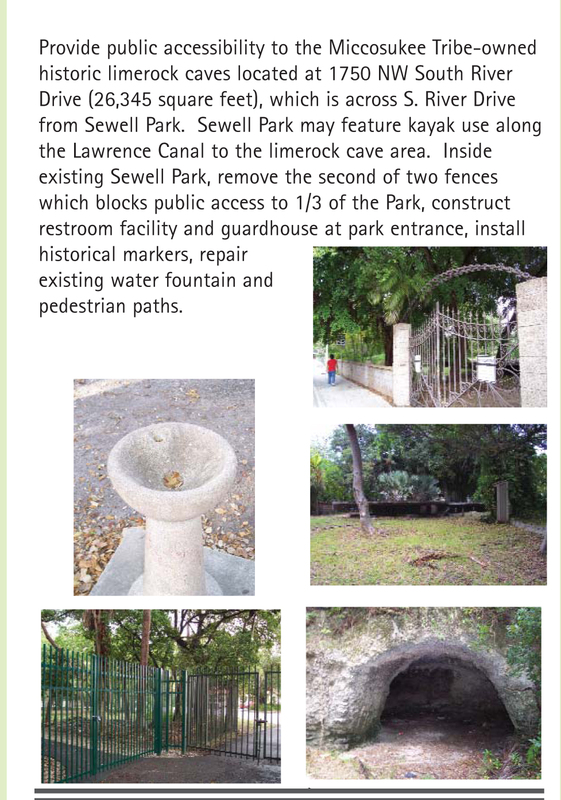 This is called Sewell Park after E.G. Sewell, a four time mayor of Miami. 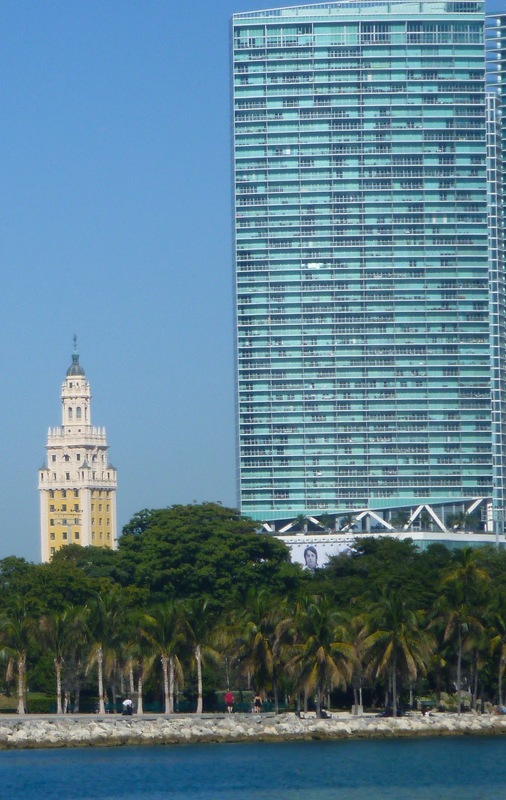 Two photos up - the Freedom Tower in downtown Miami next to a much more modern building. 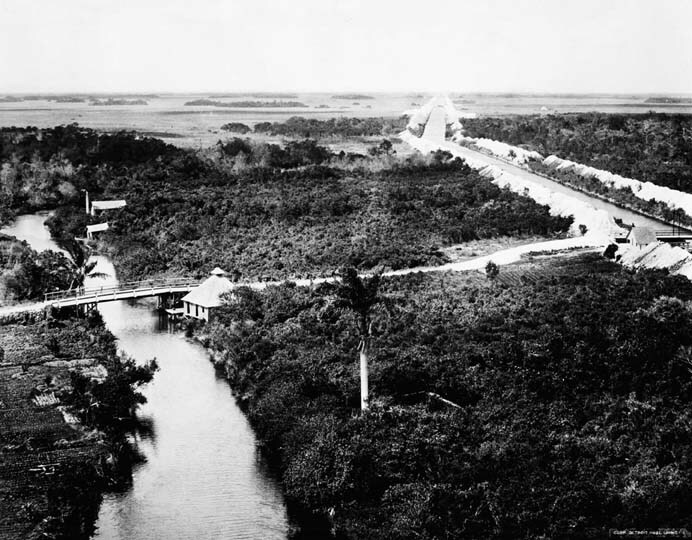 Above is what the original dredge marks along the Miami River look like from 100 years ago. 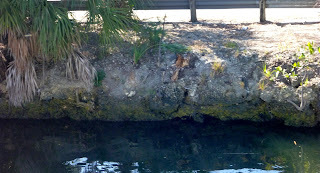 that is limestone and the dredge cut right along the edge to both widen and deepen the original shallow river. Above shows some rare greenery along the Miami river. The little hillock looks interesting among the trees - wonder where it led? 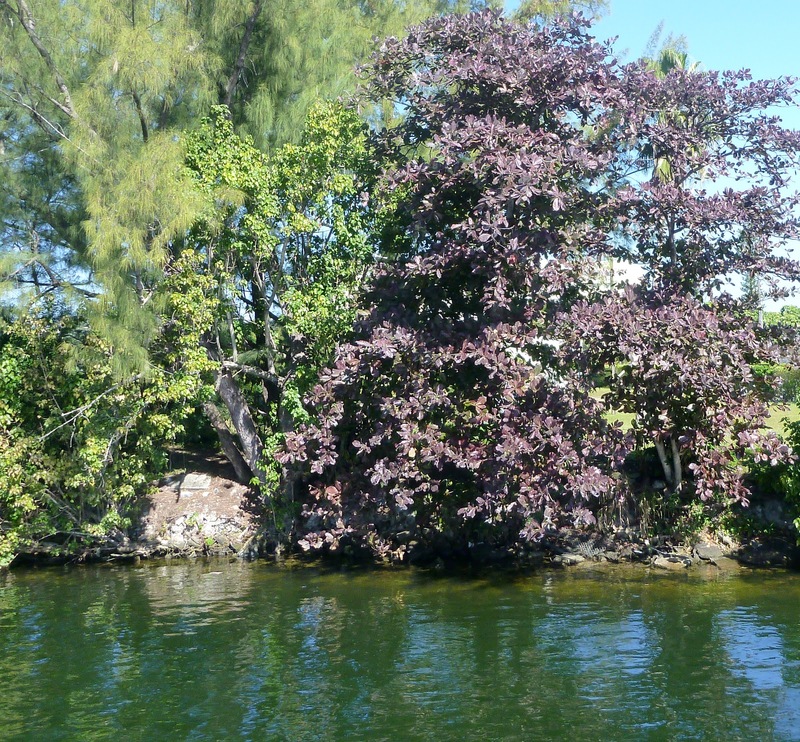 Above - original Miami River edge - at least the rocky part. 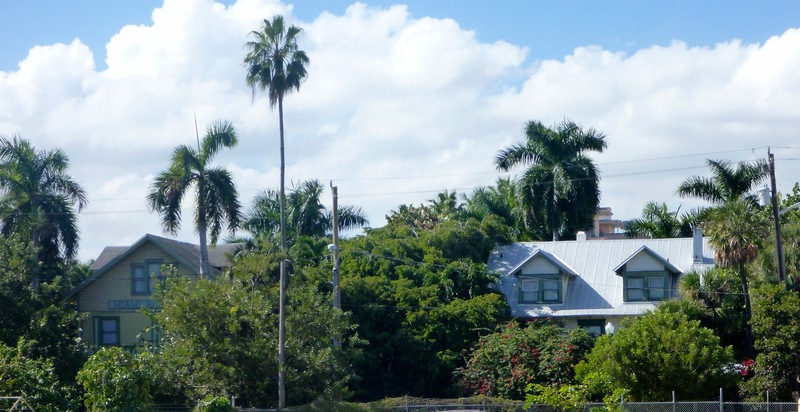 I cropped out the city looking edges and just left the trees and the old house. 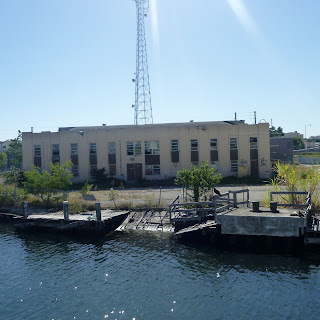 It's a commercial building today, but it looks like I imagine the old river might have looked before all the greenery was bulldozed. Above is the uncropped view of one of the wooden houses. Sigh. 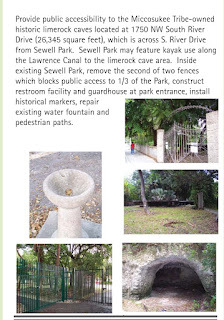 Above - a canal that leads to an Indian cave - yes, a small cave - that is next to Sewell park, but is on Indian land, so it is not open to the public. To the left is a piece of a brochure about the Miami River, specifically about the "Indian Cave". The piece of land above is more inland. 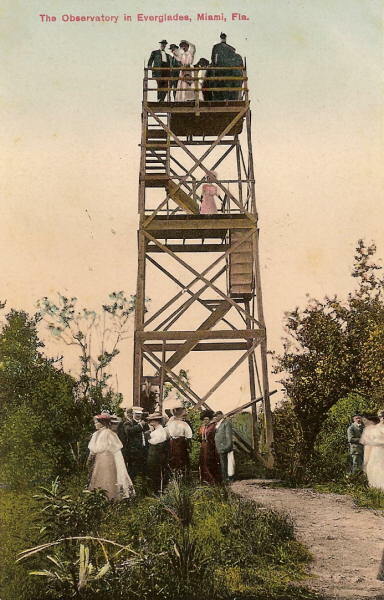 It is the original site of the tower shown below in the old postcard view. 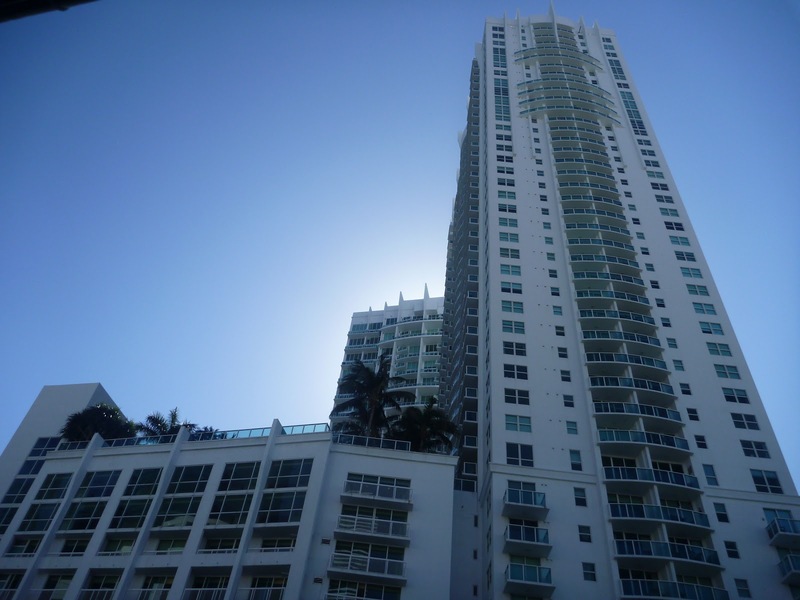 It was called Car Dale Tower. Look at the clothes on the ladies - it must have been the 1890's - that's ancient history in Miami. An old dingy along the river. It's seen better days, just like the river it's on. 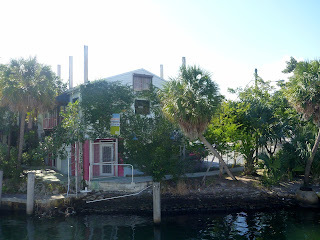 Two photos up - a very small condo of three stories, facing the river. Each had different color closed curtains, so I thought it made an interesting picture. Under that photo is a scan from a book called,"Highways & Byways of the South", published in 1904, so the picture is earlier than 1904. 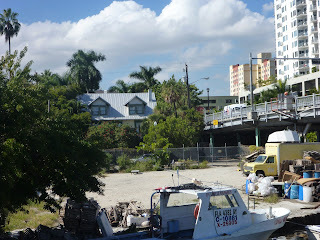 I believe a Seminole Indian is one of the peole in the boat and it is coming down the Miami River from the Everglades. 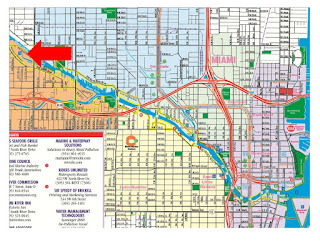 Below is a map of the Miami River up to the point of the "Miami River Rapids which is indicated by the small number 18 on the far middle upper left of the map. 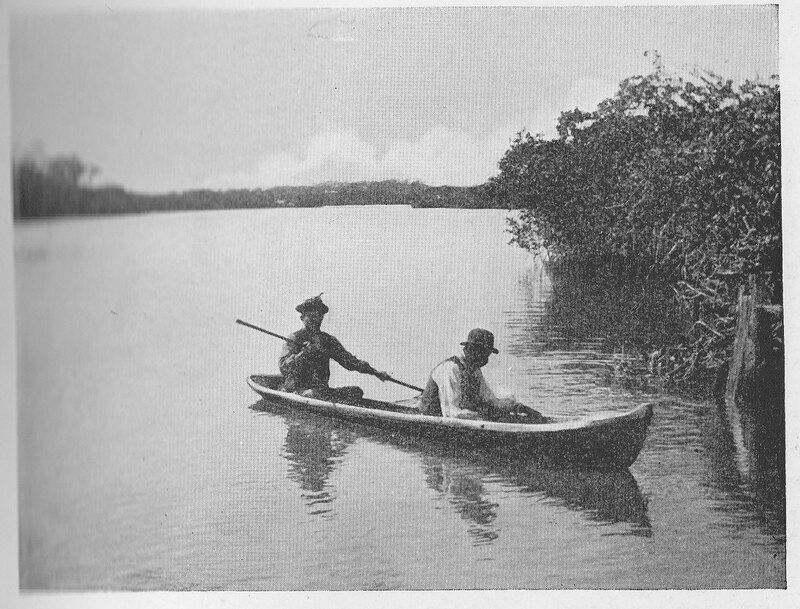 The rapids are where the original boundary of the Everglades were. 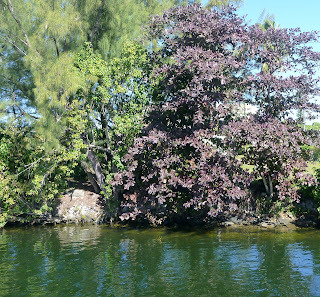 From the Everglades, the river dropped about 6 feet gradually and that difference made the rapids. Remember, you have to click on the image to see a larger view of it - this is true of all but the old images in this post. Unfortunately, some of the old pictures I've copied from web sites do not enlarge when clicked on. Above is another scan from the same book as above. 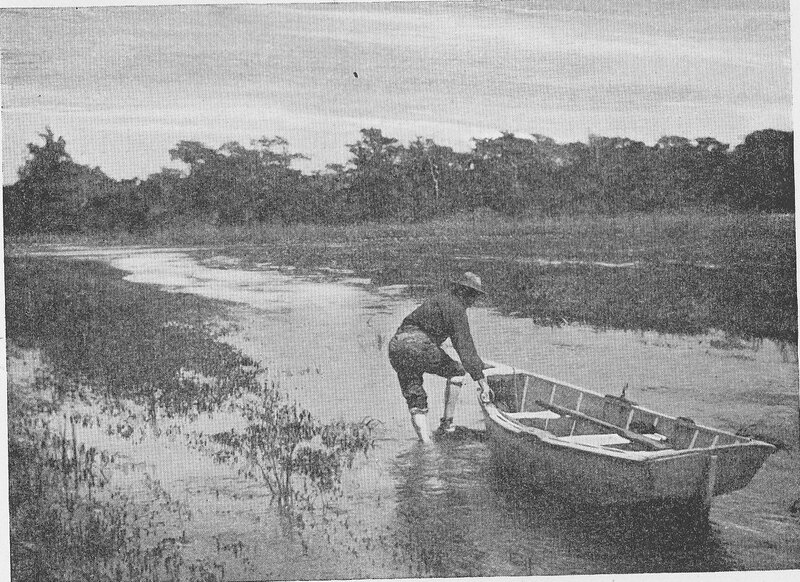 It shows a man about to enter the rapids. 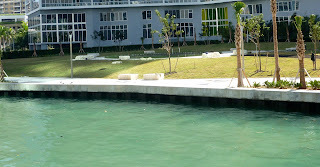 You see how shallow the river was. It didn't have very solid banks in some places. This man is just coming out of the Everglades and heading to the coast. The rapids, such as they were, are in front of him some feet away. 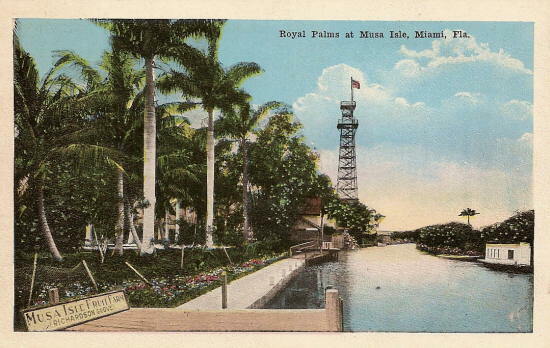 Above is "Musa Isle", another attraction that once existed along the Miami River not far from the original entry into the Everglades. Below is one of the only remaining WWII training buildings left. 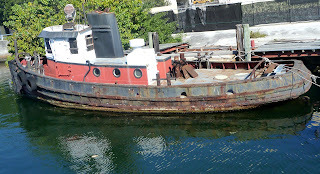 It's in pretty bad condition and so are the old docks. I did take other pictures, but they are pretty much all the same story - "progress" in the form of development. I love to imagine what it must have been like from the remaining records of early settlers. 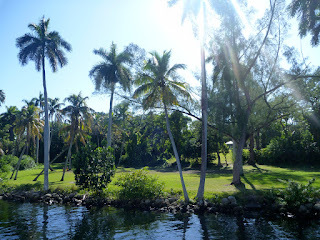 Dirt roads, jungle like growth everywhere, lots of wild animals - and the beach, river and ocean clean and pristine, unpolluted by chemicals and sewage. 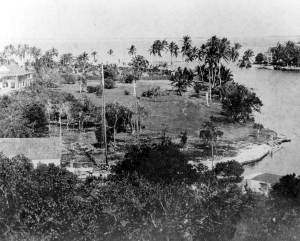 Looking South at the mouth of the Miami River, which is pointing west. I think the house is Brickell's - lots of jungle like growth. Look into the distance - just more of the same. It must have been wonderful right on the beach. Today this whole area comprises the Miami skyline (picture above). 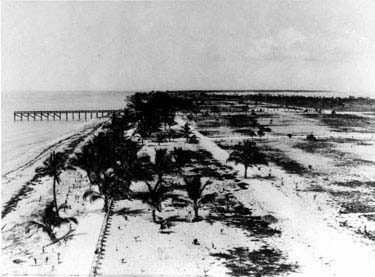 Above is an early view of Miami Beach, South. A little different than today's Art Deco area. Above is the Miami river on the left, in 1913. 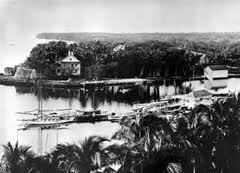 Already by that time, the Miami River canal was being dug and dredged. Just contrast the pictures above with my photos - just a little different, isn't it? 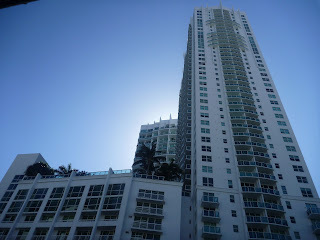 It's like any big city - like Manhattan - it's very difficult to imagine the original. Oh - and if you are curious about what Manhattan was like before the white man came - this is a fabulous web site where you can look at any address in Manhattan and see what it was like - literally at that spot - before 1620. I really like your 3 windows shot! It looks like something one would see in Nat'l Geo or a travel mag or some such. What a great idea for a song!! Love it! Now when I think of Ginkgo Biloba, I'll have the tune of Hava Nagila going through my head.